LOL. So we're all set to go into Mt. Hyjal for the first time. 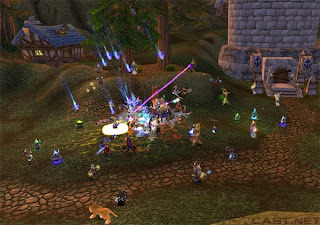 To start the event which consists of 8 waves of mobs and then Rage Winterchill himself, you speak to Jaina Proudmoore. As soon we all step foot into the area, we say "no one speak to Jaina Proudmoore"
Two seconds later, someone speaks to her and the event starts. We hadn't even given out any assignments or buffs or healthstones or water or consumed flasks. We just started going at it and in between the waves of mobs, we had everyone slowly buff up and conjured a soulwell. Then everyone was asked to put on their pvp trinkets to help with frozen tomb. So by the time Rage Winterchill phase came up we were sort of in position for what was ahead. It was messy but we did it which was really nice. First attempt, jacked up start, but still pulled it off. The second boss, Anetheron, wasn't so easy. We spent at least 4 attempts on him. We finally got the 8 waves of adds down to an art. Our biggest problem with the second boss was dealing with the infernals that drop down on random players. Next week we will have Anetheron down, mwahahahah! Get an offtank next to Jaina for the infernals and have a hunter MD infernals to the offtank and then the raid downs the infernal and goes back to the boss. I'm a nub hunter myself so if I can do it anyone can. Episode 35: Why do we still play WoW? Around the World for 350 Blossoms!